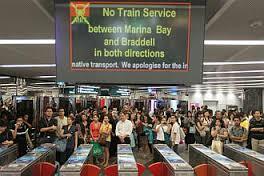 I wrote about the broken state of Singapore's public transport system back in March, 2013. At the time I pointed out the fallacy of applying free market capitalist models to providing public utilities that are natural monopolies. SINGAPORE - Singapore's public transport system should be de-privatised and be managed by the government instead of private operators, according to a prominent academic. Professor Kishore Mahbubani, the Dean of the Lee Kuan Yew School of Public Policy, said Singapore's public transport woes are a result of privatising bus, train and taxi networks. Singapore should not "remain a prisoner of old economic ideas", said Prof Mahbubani, who was speaking on Thursday (Oct 29) at the Singapore Economic Policy Forum organised by the Economics Society of Singapore. Private corporations are judged on the basis of quarterly results and have less of an incentive to spend on long term maintenance, he added. "Have we learnt from our mistakes and are we prepared to move ahead?" said Prof Mahbubani, adding that privatisation "has been taken too far" and Singapore should have the "political courage" to make changes to the system given its shortcomings.